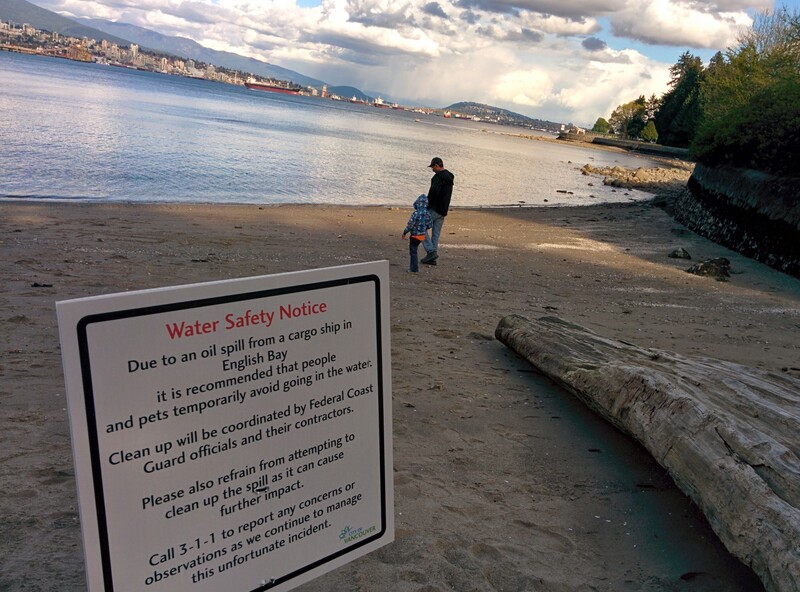 Last week’s heartbreaking oil spill in English Bay was a sobering reminder to us all about what is at risk in this beautiful part of the world, and in the Salish Sea in particular. It also made clear that ‘world leading’ spill response has a long way to go to before we can consider it effective. Many people on the scene were quick to draw the connection to the risks posed by Kinder Morgan’s Trans Mountain Pipeline and Tankers Expansion Project (KMX) and the 700% increase in tar sand filled super tankers that it would enable. The spill also serves as a reminder about why it is important for the Provincial, municipal and First Nations governments, not to mention the public at large, to have an understanding of emergency response plans in order to decide for themselves whether the risks posed by the Kinder Morgan Expansion can be mitigated or whether the purported benefits outweigh the risks. As you may recall, the National Energy Board recently denied a motion by the Province of BC to have Kinder Morgan’s spill plans made public, even though similar plans were made available under Washington State legal requirements. This move was so unpopular that even NEB chair Peter Watson has criticized the pipeline industry’s lack of transparency about emergency response plans. This, of course, is not the first time the NEB has faced criticism for the way it has handled the Kinder Morgan Expansion review process – the drumbeat of criticism has been constant from day one. Almost immediately after the hearing order was issued on April 2, 2014, the Tsleil-Waututh Nation filed a legal challenge in the Federal Court of Appeal citing several legal errors and constitutional deficiencies. The hearing order started clock on the 15-month statutory time limit, despite missing key information about a final route, human health risk assessments, geotechnical information, tanker traffic and safety, and the aforementioned emergency response plans. Indeed, the myriad of criticisms (too numerous to list exhaustively) includes limiting public participation and expression (now seeking leave at the Supreme Court of Canada); excluding climate change from its scope (see our own comment on the absurdity of trying to exclude climate change from a review of an oil pipeline); inadequate testing of the evidence by cross examination or even answering the written questions asked; and participant funding disputes with directly affected landowners to name a few. In the course of one year, the process has managed to draw complaints from residents, local businesses, municipal governments, First Nations and the BC Provincial government. Further, a group of 12 First Nations intervenors sent an open letter to Minister of Natural Resources Greg Rickford, questioning the constitutionality of the process and citing numerous deficiencies with the process itself. Grand Chief Stewart Phillip, Ta’ah Amy George, and Rueben George were among the thousands who gathered at Burnaby Mountain in November, 2014. Photo by Eugene Kung. The public’s frustration with the NEB and Kinder Morgan came to a head last November with a mountain of opposition emerging during contested test-drilling on Burnaby Mountain over two rain-soaked and muddy weeks. And no wonder; the NEB was not set up to complete a thorough, holistic review of KMX. Following the gutting of Canada’s environmental laws in 2012, the NEB became the sole federal regulator responsible for reviewing KMX, including the conduct of the Environmental Assessment. CEA 2012 legislated a 15 month time frame for the NEB to complete its review, which was extended by 7 months last summer when Kinder Morgan decided it was easier to drill through a mountain than convince people their pipeline was a good idea. Since that initial extension, the NEB has been loath to prolong its schedule any further, despite Kinder Morgan’s repeated failure to provide the information they promised in a timely manner, resulting in a limited opportunity to test that evidence. Instead, the NEB squeezed three additional rounds of written requests into the current timeline on key issues such as seismic risk and tanker traffic safety. It has become apparent that the NEB process does not constitute a 'public hearing' and is completely inadequate to assess the health and safety risks of a proposed pipeline through major metropolitan areas, and the potential risks of shipping bitumen oil to Burnaby and through Burrard Inlet, the Salish Sea, and along the coastline of British Columbia. We have serious concerns that the current NEB panel is neither independent from the oil industry proponents nor ready or able to assess the public interest of British Columbians. I joined WCEL in 2014 to oppose the KMX which crosses through my hometown of Burnaby, after having practiced regulatory law before the BC Utilities Commission for 5 years with the BC Public Interest Advocacy Centre. I have never seen or heard of a regulatory process that was so extensively criticized by such a wide swath of participants. What is happening in the KMX hearing is a cautionary tale for those participating in other NEB processes, such as TransCanada’s Energy East pipeline review, now underway. In fact, things may get worse, not better as the NEB recently announced that it was going to cut its operating budget nearly 1/4 over the next two years. This is not how you build social licence for a project. It’s how you destroy it. [Social Licence to Operate] is in effect a recognition that that the views and aspirations of stakeholders that are or may be impacted by a project (such as local communities and non-governmental organizations) can make a critical difference in whether a project proceeds or not. […] In a context where Canada’s environmental laws are being aggressively weakened in favour of big resource companies, and where many Canadians are feeling alienated and excluded from formal environmental decision-making, [the concept of social licence] is rapidly gaining importance. Many of us were heartbroken, distraught and angry with last week’s spill and bumbled response as the reality of the impacts of an oil spill literally hit home. It was a sobering reminder of what we are fighting to protect – the beautiful and precious Salish Sea. Kinder Morgan and the NEB were not responsible for this spill, (although Kinder Morgan may in fact profit from it); however, the fact that it was a comparatively small spill from a brand new ship on its maiden voyage makes clear that spills happen, and there aren’t enough conditions for approval that can change that. And when they do happen, we cannot rely on ‘world leading’ spill response to be effective. So let us never forget, so that it never happens again.